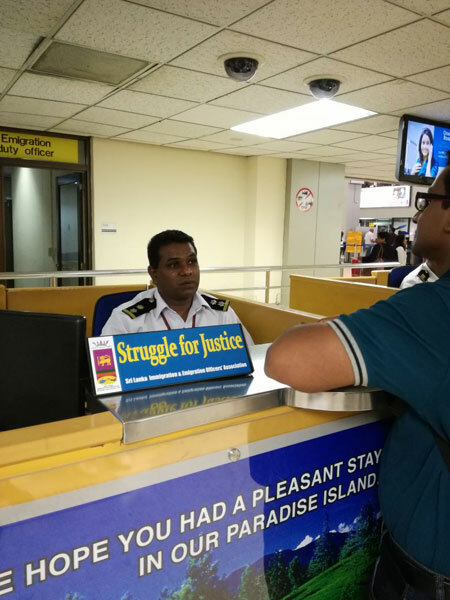 The Sri Lankan Immigration and Emigration Officers’ Association (SLIEOA) yesterday launched a trade union action in response to the failure of the government to provide a resolution to their demands. the problems officers face have not been addressed for almost two decades. The association’s key demands are for an approved service minute, the re-establishment of the prosecution department of the immigration department and the deployment of officers to foreign missions abroad. 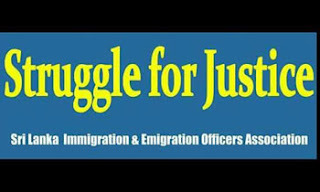 As part of the protests, officers are displaying banners and distributing pamphlets to raise awareness of the union’s grievances at the immigration counters at the departure terminals of Mattala and Katunayake Airports, all harbours and the posts at the Department of Immigration and Emigration Head Office in Battaramulla ordinarily attended to by the immigration and emigration officers. The SLIEO has however assured the public that there would be no interruption to services at any of these counters during the protest. Mr Kanugala explained that one of the SLIEOA’s key requests, the establishment of a service minute, is necessary for “smooth and steady recruitment.” Service minutes outline the qualifications a person must have to be appointed as an officer, the opportunities for career progression and the procedures involved in recruitment and promotion. Service minutes need to be approved by the cabinet. Currently, the majority of public service sector professions have them.